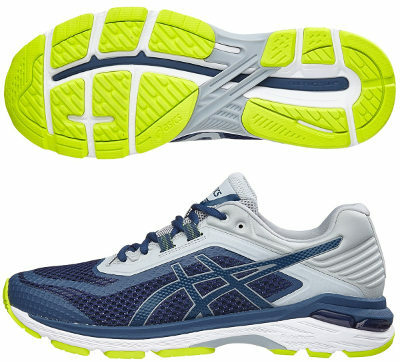 Asics GT 2000 6 are stability cushioned running shoes. The completely renovated Asics GT 2000 6 takes advantage of new flagship material for midsole FlyteFoam™ from japanese brand to incorporate many interesting changes staying true to its soul. Always behind the powerful (and expensive) Gel Kayano 24 and one step above its smaller sibling GT 1000 6, the success of the GT 2000 6 is backed by great money for value, a great option for those running long distances or just daily training and looking for moderate pronation support at reasonable price. There are many changes compared to its predecessor GT 2000 5 and not just minor cosmetic ones. Upper is based on seamless mesh more breathable to increase ventilation in the forefoot and more dense to provide better stability support in the rearfoot. In addition, there are a couple of straps embracing midfoot which end in eyelets so are adjustable using custom pressure from lacing system for secure fit. Although it is new solution for Asics, mentioned straps are very similar to well known Flywire technology from Nike. There is no doubt the most interesting change in GT 2000 6 is the use of the mentioned FlyteFoam™ as main component in the midsole, something more and more common among Asics lineup. As expected, GEL® pad units are embedded to enhance comfort in both forefoot and rearfoot while topsole is made of SpEVA featuring a more responsive ride in a similar way premium Gel Nimbus 20 does. Some of the little that remains is the stability solution based on internal medial post which offers progressive pronation control (dual density Dynamic DuoMax®) combined with classical plastic shank (Trusstic System®) in the midfoot for necessary stiffness. Outsole keeps design and materials with durable AHAR+ on more exposed areas.